American Girl lovers know that behind every American Girl doll is a wonderful story! With March being reading month, I'm happy to help One Michigan Mom find Addy Walker a new home! Addy Walker represents the America of 1864, and a family's escape from slavery to freedom. I've escaped to a new life. My whole world is opening wide, but I'm learning that freedom doesn't make everything easy. Through it all, family is what keeps me going. Just the thought of us all together gives me strength. This giveaway is co-sponsored by This Mama's Life, Beyond Attachment Parenting, and Stingy Thrifty Broke. This giveaway was originally announced on Link Me to Deals! 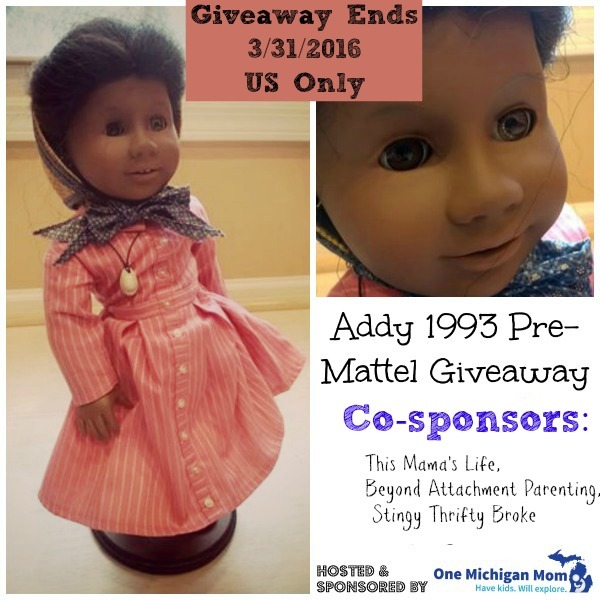 Addy, American Girl giveaway for March 2016. Addy was a collector's doll and has passed through some hands via collector's sales, so she shows some age, but she is still wonderful, even with the beginning of silver eye (which is a free fix from American Girl). When it comes to American Girl - know that these stories really can help us all learn to celebrate America, and the struggles seen through the ages. When reading American Girl books, a realistic depiction of life is opened up to the reader. In Addy's book, you'll discover what it was like to grow up during America's Civil War, your daughter can play with Addy and interact with her and become her best friend. I would like to keep this as a collector's item! My daughter loves the Addy series! This would be for my daughter. Thanks so much for the chance! This would be for a child. FYI - I can't get any of the pins to pin for entries as there are not any pictures coming up. This would be for a child (grandchild). This doll would be for a child. My daughter is 14 and would use this as a collector item.